judo players of the Brazilian Team A (n=7) with the judo players of Teams B and C (reserves; n=15), and (2) to verify the association between the variables measured. 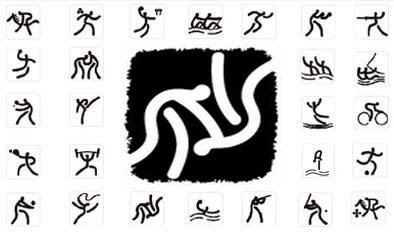 Thus, 22 athletes from the seven Olympic weight categories were submitted to: a body composition evaluation (body mass, height, ten skinfolds, eight circumferences, three bone diameters and percent body fat estimation); the Special Judo Fitness Test (SJFT); maximal strength tests (one repetitionmaximum, 1 RM, in bench press, row, and squat); and the Cooper test. One-way analysis of covariance was used to compare the groups. The relationships between variables were determined by the Pearson coefficient correlation. The significance level was fixed at 5%. No significant difference was found in any variable between them. The main significant correlations observed were between the following variables: VO2max and number of throws in the SJFT (r=0.79); percent body fat and estimated VO2max (r=0.83) and number of throws in the SJFT (r=0.70); chest circumference and bench press 1 RM (r=0.90) and in the row (r=0.80); and thigh circumference and squat 1 RM (r=0.86). However, there was no significant correlation between circumferences and 1 RM/kg of body mass. According to these results the main conclusions are: (1) the physical variables measured do not discriminate performance when analysis is directed to the best athletes; (2) a higher percent body fat is negatively correlated with performance in activities with body mass locomotion (Cooper test and the SJFT); (3) judo players with higher aerobic power performed better in high-intensity intermittent exercise; (4) judo players with bigger circumferences present bigger absolute maximal strength. Ju-No-Kata. Kodokan Kata Tournament 2007. Using judo as a cross training method is not a new concept throughout the world, but over the last couple of years it has been adopted in Britain by teams such as Bath and Leicester Tigers, as well as the England Junior Academy, who brought judo Olympic silver medallist, Kate Howey, on board to work with their young squad. In early 2006, the British Judo Association formed a new partnership with Leicester Tigers Rugby Club. The rugby giants were in no doubt that judo could improve the performance of their squads and they have since implemented the sport at many levels. Integral to the partnership is Wayne Lakin, a British Judo World Class Start Coach, who now works equally between rugby and judo. Judo does not only benefit the elite. It can offer a great deal to young and amateur athletes as well as coaches. This is fundamentally because judo techniques provide basic skill movements, which are transferable onto the pitch. Juan P. Goicoechandia (tori) & Roberto Villar (uke). Classification of Innovative International Competition Techniques. This presentation supports the case for specifying and naming contest waza that have previously only been recognised as variations of the established techniques. The rationale for this is that it will assist coaches in the teaching and demonstration of contest techniques. To give an example; any leg-grabbing action (one of the highest scoring actions in major tournaments) will be termed simply 'ashi-dori', but the specific variation used may require different direction of force and/or hand placement. 1st Kodokan Judo Kata International Tournament 2007: Japan - Toshimitsu Takahashi (tori) & Fumikazu Yoda (uke). For judo players, as in many sports activities, strength development has become an important element of performance. However, this should not be done separately from the development of technique. Specific strength training is thus used for the controlled strengthening of specific muscles or muscle groups, corresponding to the movement in a competitive situation. In line with this, the use of a judo specific apparatus is proposed. The aim of this study is to analyze the progress of a group of judokas after a training program with the apparatus. The results have shown that, using the apparatus, the heaviest weight achieved using the throwing technique is greater. In addition, the judokas’ technique improves as a consequence of this training program. This judo specific apparatus could therefore be used to complement traditional judo training. Relationship between techniques and injuries among judo practitioners. Daniel Barsottini, Anderson Eduardo Guimarães and Paulo Renato de Morais. Research and Development Institute, UNIVAP. Judo is a Martial art created in 1882 characterized by a great number of techniques and philosophical basis, and it has been mentioned in several studies as one of the sports presenting a higher amount of injury occurrences. Nevertheless, there are few detailed surveys to allow performing a causal correlation between the technical aspects and the percentage picture of the injuries found in this sportive modality. The sampling was constituted by seventy-eight case reports attained after applying a close questionnaire in forty-six 23 years old ± 10 years male athletes, and thirty-two 19 years old ± 7 years female athletes. The mean time of practice for male athletes was 9 ± 6 years, and their level was distributed as follows: 20% black belt, 50% brown belt, and 30% distributed as follows: 20% black belt, 50% brown belt, and 30% mean time of practice of 5 ± 3 years, distributed as follows: 9% black belt, 25% brown belt, and 66% with lower than brown belt level. After applying a questionnaire, it was observed that injuries occurred in 23% prevalence in the knee joint, followed by 16% in the shoulder, 22% in fingers and toes, and the remaining occurences amounted 39%. 10% of injuries were mild, 9% were moderate injuries, and 63% were severe injuries. The relationship of the training injuries attained 71% of the cases, and 42% of that total occurred when heavier fighter participated in the training. The most frequent strokes that caused injuries were the Ippon seoi Nague , with a 23% incidence, the Tai otoshi , with 22%, and the Uchi mata , 9%. Super World Cup Judo Rotterdam 2007. At the level of first principles, the essence of Kodokan1 Judo  is the turning an opponent's strength and overcoming by means of skill rather than sheer strength. This theory is captured by the Japanese expression ju yoku go o seisu – usually translated in a number of ways e.g. softness overcomes hardness, flexibility overcomes stiffness, gentleness controls strength or win by yielding. Weight-Class Sports: Description, Physiology Of Weight Cycling. School of Family and Nutritional Sciences, 2205 East Mall, University of British Columbia, Vancouver, B.C. Canada V6T 1Z4. Weight class sports are those sports that require the athletes to achieve a specific body weight or body weight range before they are allowed to participate in competition. There are also sports where a low body weight is desirable for aesthetic reasons, but the requirement is more implicit than absolute. The competition weight is often much lower than the athlete's usual weight, and weight regain readily occurs during the off season. A pattern of repeated weight loss and regain is called weight cycling. It has been speculated that weight cycling may lead to physiological effects which may have an impact on the athletes performance and health. Physiological changes such as a lowering of metabolic rate, altered body composition and fat distribution, and hormonal changes have been investigated. The limited data available in athlete populations generally suggests no prolonged physiological effects. However, it is an issue that, at present, is not completely resolved. Just a nice judo cartoon found on the internet. Assessment of maximal cardiorespiratory performance and muscle power in the Italian Olympic judoka. Sbriccoli P, Bazzucchi I, Di Mario A, Marzattinocci G, Felici F.
Applied Physiology Laboratory, Department of Human Movement and Sport Sciences, University Institute for Movement Sciences, Rome, Italy. The main purposes of this study were to describe the cardiorespiratory fitness and lower limbs maximal muscle power of a selected group of Olympic Italian male (M) and female (F) judokas. Eleven subjects (6 M, 5 F) underwent 3 different tests. The VO(2)max and ventilatory threshold (VT; V-slope method) were assessed during a graded maximal treadmill test. Lower limbs muscle peak power (PP) and mean power (MP) were determined during a 30-second Wingate test (WIN). Post-WIN blood lactate peak was also measured. Subjects were tested also during a 5-minute combat test (CT), during which blood lactate and heart rate (HR) were monitored. VO(2)max (mean +/- SD) was 47.3 +/- 10.9 and 52.9 +/- 4.4 ml x kg(-1) x min(-1) for M and F judokas, respectively. The VT corresponded to 80.8% (M) and 86.5% (F) of VO(2)max. Both PP and MP, measured during the WIN, were significantly higher (p <0.05). In conclusion, Italian Olympic judokas showed high levels of muscle power but accompanied by a moderate engagement of the aerobic metabolic pathway, which is well in accordance with the characteristics of judo. Having these results in top-level athletes may represent a useful contribution to the work of coaches and trainers in optimizing training programs for the achievement of the best performance of the judoka. J Strength Cond Res. 2007 Aug;21(3):738-44. A nice picture of the Super World Cup Judo Rotterdam 2007. 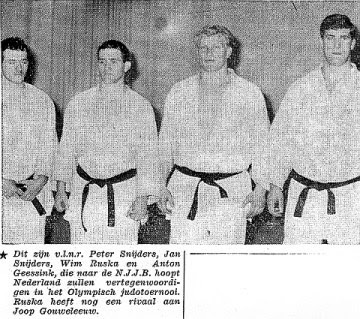 The complete series at website of Judoschool Jan Snijders (see links). Kinematics of the judo throw Harai-goshi. A kinematic comparison of the judo throw Harai-goshi during competitive and non-competitive conditions. 1 California State University Sacramento, Department of Kinesiology and Health Science, Sacramento, CA, USA, 2 Tokyo Gakugei University, Japan. The purpose of this study was to compare the kinematics of kuzushi/tsukuri (KT) phases of the harai-goshi throw under competitive and non-competitive conditions. A third degree black belt subject served as the tori (thrower) for both conditions. Two black belt participants ranked as first degree and fourth degree served as the uke (faller) for the competitive and non-competitive conditions, respectively. Two video cameras (JVC 60 Hz) and a three dimensional motion analysis system (Vicon-Peak Performance Technologies, Inc., Englewood, CO) were used to collect and analyze peak velocity for the center of mass (COM) of uke and tori and peak angular velocity of tori’s trunk (TAV). Data were smoothed using a 4th order zero lag Butterworth filter with a cut-off frequency set by the Peak software optimization technique. All variables were normalized by time as a percentage of the KT phase. In general, the COM directional velocity patterns were similar between conditions. Uke’s defensive efforts during the competitive condition created differences in timing and magnitude of peak COM and TAV velocities. During competition, tori created larger peak COM velocities onto uke which indicated greater throwing power. their hips during the entrance of the throw and a clockwise TAV created by the shoulders turning to complete the 180 degree body turn with the simultaneous leg sweep. It is thought that the counterclockwise rotation aids in producing a pre-stretch of trunk muscles which helps to create greater trunk rotation power. Three-dimensional joint dynamics and energy expenditure during the execution of a judo throwing technique (Morote Seoï Nage). Blais L, Trilles F, Lacouture P.Equipe Mécanique des Gestes Sportifs, Laboratoire de Mécanique des Solides, Université de Poitiers, Poitiers, France. A new method for analysing judo throwing techniques is proposed. Beyond a solely descriptive analysis of the kinematic parameters, we determined the main active joints and segments in the execution of a judo throwing technique. This was achieved by calculating three-dimensional joint dynamics parameters. The environment of the judoka was manipulated by using a judo-specific ergometer to replace his partner. The ergometer was used together with two force sensors coupled with two force platforms, and six synchronized infrared cameras. Sixteen French athletes competing in senior national events participated in this study and executed the throwing technique Morote Seoï Nage ten times, using the Mayeur ergometer loaded with 20 kg. This load was chosen to cover variations in the athletes and represents the effective mass they have to displace during the movement. Our main aims were to evaluate the forces and moments at the main joints in three dimensions during Morote Seoï Nage, and determine the energy expenditure of the athletes during the movement. Contrary to the teaching of some judo coaches and experts, our results show that the main driving moments are generated by the lower limbs [mean 24% (s = 4) of the total moments at the knees and 29% (s = 3) at the hips] and the trunk (mean 28%, s = 3) and not the upper limbs. Moreover, our results show that most energy expenditure (mean 880 J, s = 160) occurs during the Tsukuri phase, when the Tori (the person who throws) is positioned under the Uke (the person who is thrown). J Sports Sci. 2007 Sep;25(11):1211-20. Recently I started working on diagrams to explain the foot positioning in judo throws. 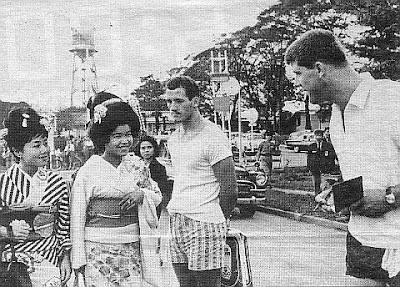 Below you see an example of O-Goshi. I would welcome comments to help me improve the general lay-out before starting all the work.